Welcome to Fashionista Piranha Book Blog, where a good book is always your best accessory! Life is too short to waste reading bad literature, especially when there's so many good books out there. If I can keep you from reading one atrocious novel, I've done my job. But if I help you find something you'll enjoy, even better. I've achieved my goal. Sometimes I will wander off-topic and talk about theater productions I've seen. Usually - but not always - it'll be Shakespeare-related (most commonly the plays from the Oregon Shakespeare Festival) or a stage adaptation of a classic book. But if I see a show and I'm super-excited about it, odds are that it'll show up on Fashionista Piranha. Less frequently, movie adaptations of books will make a similar appearance. I always enjoy hearing from visitors to the blog, so please feel free to leave comments or email me at fashion_piranha @ livejournal.com. This includes you, publishers and authors! I am always happy to discuss your projects with you; feel free to check out my review policies here and drop me a line. Life and work have been so hectic lately that I haven't had a chance to really read, let alone write up reviews. I know that things will only get busier the closer we get to the holiday season, so rather than dig myself into a deeper pit of guilt because I can't keep up, I'm just going to go ahead and put the blog on hiatus. Fashionista Piranha will come back in some form, but as part of the break I'm going to take a long, hard look at the blog and what I want to accomplish with it. My husband and I have been developing a concept for a Youtube project that we hope to launch next spring, and until I see what time commitments that requires I don't know how often I'll be able to update my book reviews. I will return with either reviews or a fresh update in March 2017. 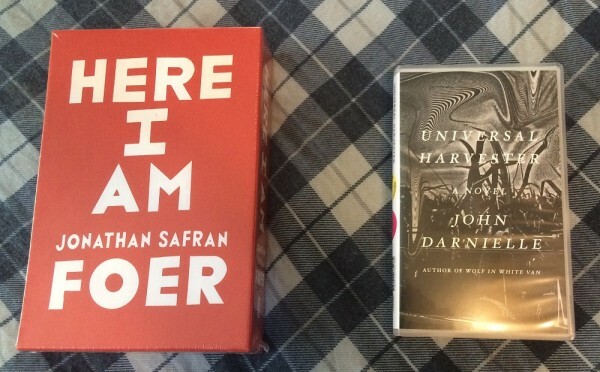 Since 2008, Powell's Books of Portland, OR has run a book club/subscription service that sends a new, autographed hardcover book in a custom slipcase to its subscribers. Each mailing is accompanied with notes on the selected book and a surprise selection of extra items. There was so much buzz about this book at BEA! I didn't have a chance to pick up one of the galleys, or one of the beautiful canvas tote bags with the cover art screenprinted on one side, but the strong graphic style kept the book lodged in my memory. I know you shouldn't judge books by the cover, but let's face it - sometimes that's what will linger. 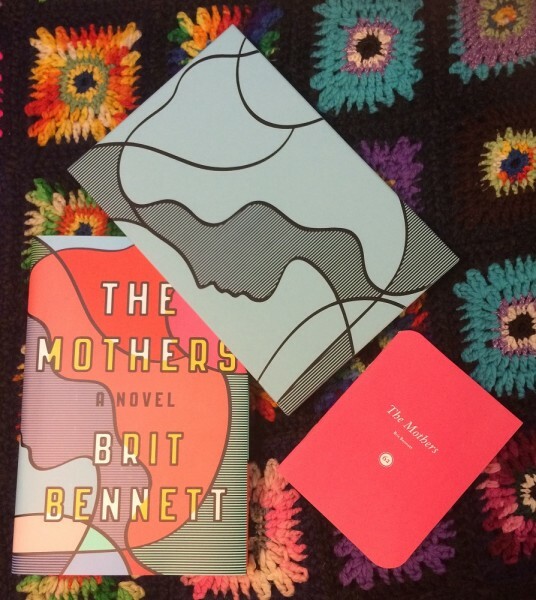 I've read some excellent reviews of The Mothers and I've wanted to read it, so I'm happy this was an Indiespensable choice. This is exciting! 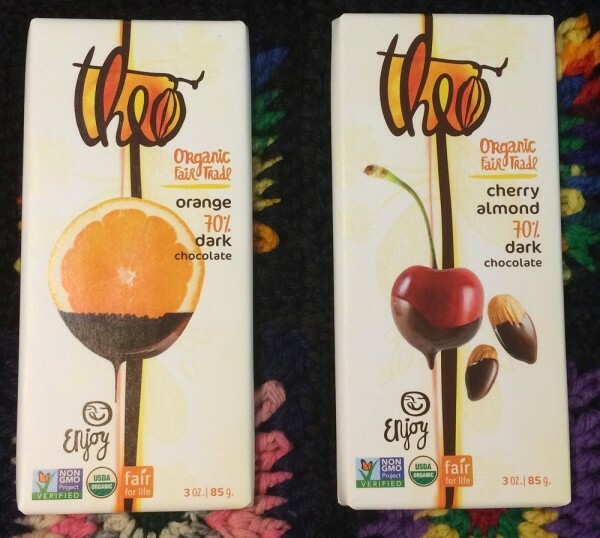 I was at a trade show recently and one of the vendors was carrying Theo Chocolate, so I had the opportunity to try several of their holiday bars. The chocolate was sooooo good! I can't wait to eat these. Chocolate orange is definitely my preference between the two bars, but either one should be delicious. I'm so glad Powell's threw some candy in this box. I love snacking while I read, and it's been a while since they sent anything for me to nibble with my book. Powell's Indiespensable subscription costs $39.95 per box. To learn more about it, visit the Indiespensable page at Powell's Books. I was so sad to hear of the passing of Natalie Babbitt a few days ago. Babbitt's book Tuck Everlasting is one of the most haunting I've ever read. When I first encountered it in elementary school, its beauty and poignancy hit me hard. It was the first time I fully understood the power of the written word, and from then on I judged books by whether they could strike as deeply to my core as that book did. In a statement, Samuel F. Babbitt shared this reflection: “Natalie was a remarkable woman. While more than fulfilling her roles as wife and mother, she sharply observed her fellow humans, shaping stories that helped her and her readers grapple with both the trivial and fundamental trials of life. Words were precious things to her, and she chose them, shaped their facets, and set them on the page like a master jeweler. 2010: Discussion Question + Happy Halloween! 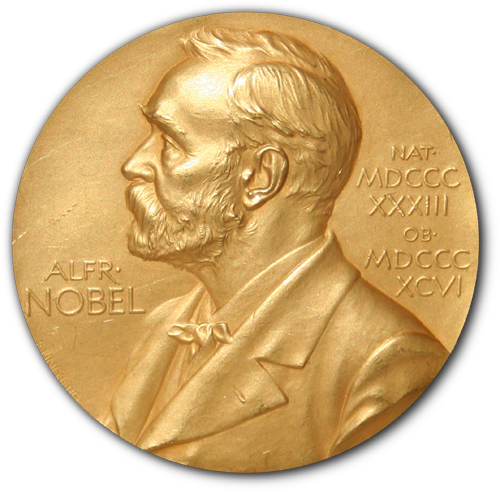 2016 Nobel Prize Winner announced! The 2016 Nobel Prize for Literature winner has been announced! This year, the prize goes to Bob Dylan. The American singer-songwriter was so honored "for having created new poetic expressions within the great American song tradition". Congratulations to Mr. Dylan! I have to admit, I never would have guessed he'd be an Nobel winner, although I grew up with his songs in the background of my childhood because my father was a fan of Dylan's early work. It seems so outside of the box - but not in a bad way. I'm quite pleased. 2009: Random Ranting: Why is it so hard to find a good place to read? How do we fulfill our conflicting duties as father, husband, and son; wife and mother; child and adult? Jew and American? How can we claim our own identities when our lives are linked so closely to others’? These are the questions at the heart of Jonathan Safran Foer’s first novel in eleven years―a work of extraordinary scope and heartbreaking intimacy. Unfolding over four tumultuous weeks in present-day Washington, D.C., Here I Am is the story of a fracturing family in a moment of crisis. As Jacob and Julia Bloch and their three sons are forced to confront the distances between the lives they think they want and the lives they are living, a catastrophic earthquake sets in motion a quickly escalating conflict in the Middle East. At stake is the meaning of home―and the fundamental question of how much aliveness one can bear. 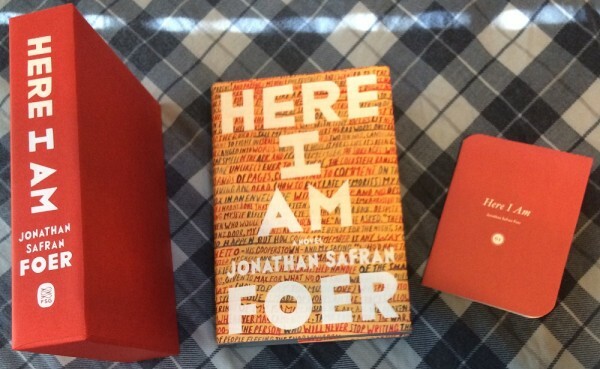 I recognize Jonathan Safran Foer's name, but I've never read his books. I can't decide if I think this sounds like something I'd enjoy, but I might give it a try since he has become quite the darling of the literary world. 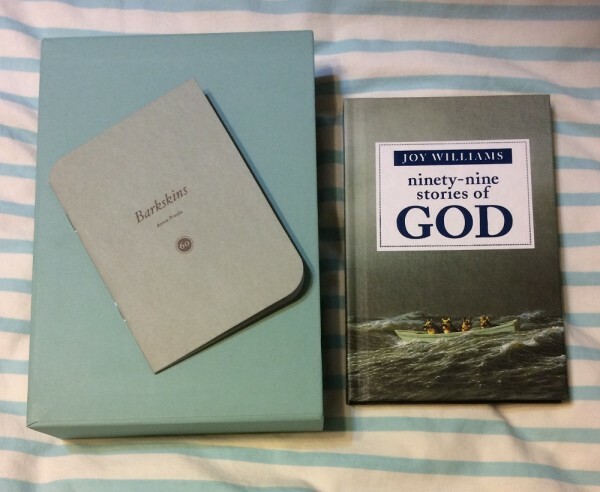 If I read at least a little of the book, it'll help me fake my way through being a literary hipster, right? 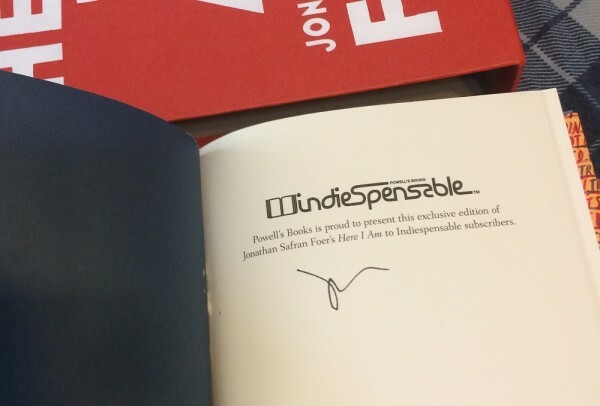 Each Indiespensable featured book has an autographed page added to the book, which is pretty neat. It's a feature I really appreciate with the subscription. Unfortunately, in this instance they didn't do a very good job gluing the page in - you can see some damage from stray glue spots along the page edges at the spine. Jeremy works at the Video Hut in Nevada, Iowa. It’s a small town in the center of the state―the first a in Nevada pronounced ay. This is the late 1990s, and even if the Hollywood Video in Ames poses an existential threat to Video Hut, there are still regular customers, a rush in the late afternoon. It’s good enough for Jeremy: it’s a job, quiet and predictable, and it gets him out of the house, where he lives with his dad and where they both try to avoid missing Mom, who died six years ago in a car wreck. Jeremy doesn’t want to be curious, but he brings the movies home to take a look. And, indeed, in the middle of each movie, the screen blinks dark for a moment and the movie is replaced by a few minutes of jagged, poorly lit home video. The scenes are odd and sometimes violent, dark, and deeply disquieting. There are no identifiable faces, no dialogue or explanation―the first video has just the faint sound of someone breathing― but there are some recognizable landmarks. These have been shot just outside of town. I usually dislike receiving an ARC (Advance Reader Copy) in Indiespensable boxes, because these promotional books are free from the publishers to booksellers so I always have plenty of them around the house. 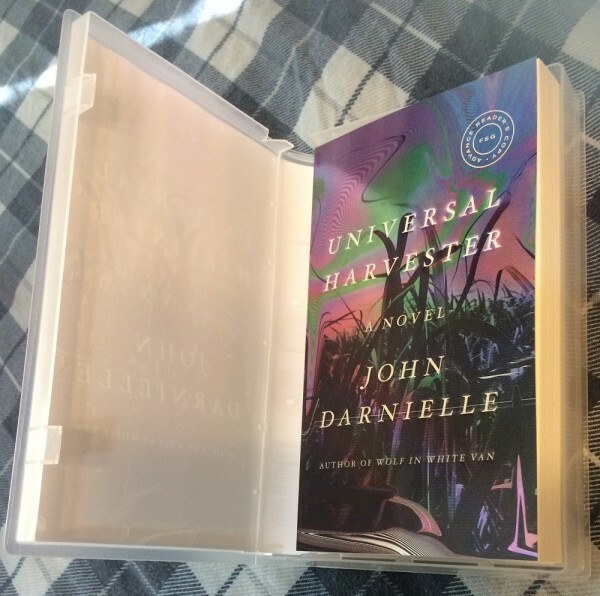 However, I am a sucker for good promotional packaging, and the decision of some marketing smartiepants to put the ARC inside of a video case, just like the ones used by Blockbuster and Hollywood Video back in the day, makes this a somewhat collectible item and a pretty neat idea. Plus, I enjoy horror novels, so I would have happily read this one anyway. This is the second month in a row that the box has only contained books, no special items like candy or water bottles. I miss that extra touch - it set the box apart. 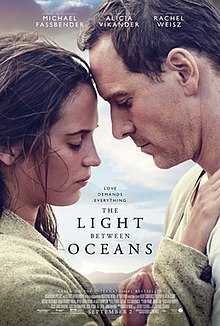 Plot Summary: A lighthouse keeper and his wife living off the coast of Western Australia raise a baby they rescue from an adrift rowboat. 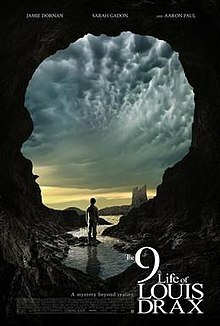 Plot Summary: A psychologist who begins working with a young boy who has suffered a near-fatal fall finds himself drawn into a mystery that tests the boundaries of fantasy and reality. 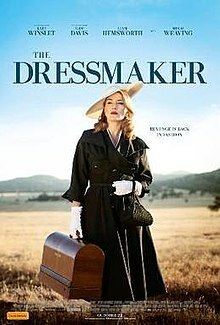 Plot Summary: A glamorous woman returns to her small town in rural Australia. With her sewing machine and haute couture style, she transforms the women and exacts sweet revenge on those who did her wrong. 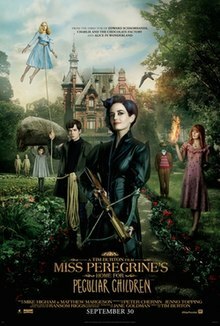 Plot Summary: When Jacob discovers clues to a mystery that spans different worlds and times, he finds Miss Peregrine's Home for Peculiar Children. But the mystery and danger deepen as he gets to know the residents and learns about their special powers. Nearly a decade ago, Jenny Cavanaugh was brutally murdered in her home. Ever since, she has haunted 826 Auger Lane. After all this time, she has finally asked Jackaby and Abigail Rook to help her remember the circumstances of her death so that she can identify her killer. As Abigail begins to experiment with possession so that she can access Jenny's locked-up memories, a series of deaths erupt that curiously mirror the circumstances of their ghostly investigation. Realizing Jackaby and Abigail may be able to protect future victims from the her fate, Jenny urges them to partner with the police to solve the gruesome crimes. Jackaby and Abigail will probe deeper into the supernatural than ever before on a mystery that will take one of them to the depths of the Underworld itself. This series is always so good! Each story blends mystery, suspense, and humor with fast-paced adventure and a rich Gothic atmosphere. Ghostly Echoes goes a little deeper and a little darker, introducing more creatures from folklore into New Fiddleham. I really came to appreciate Ritter's depth of research as he pulls from all cultures of the world for his otherworldly characters. His human characters are equally captivating. The mystery of Jenny's death has been building for the past two books, and as Abigail and Jackaby dig deeper into the past, we experience more of the personal history not just of our favorite spook Jenny, but also of Mr. R. F. Jackaby himself. When Abigail stumbles across his record of his own work as a Seer, as well as the seers before him, we finally catch glimpses of his childhood, his origins, and the rich history of his work. It's so...well, for lack of a better word, so cool. So well done. So exactly what you'd expect of Jackaby. I don't think I've ever commented on the covers of these books, but they're so beautiful. When I saw the blue cover of Jackaby on a shelf, I was immediately drawn to it, and that distinctive silhouetted cover was the hook that finally got me to start reading. (Let's not pretend we don't all occasionally judge a book by its cover.) I was so happy that Beastly Bones and now Ghostly Echoes have continued in the same vein. I've not seen it confirmed officially, but I believe we see the profiles of Jackaby on the first cover, Abigail on the second, and Jenny on the third. It makes me wonder which character will be on the next book. Charlie Cane? Lydia Lee? I can't wait to see, although I don't like thinking about how long that wait will be, since this book just came out on Tuesday and who knows when the next one will hit the shelves. To read more about Ghostly Echoes, buy it or add it to your wishlist click here. In the kingdom of Illéa, the future queen is selected through a random lottery. Thirty-five girls are chosen from different districts throughout the land, and they compete in a Bachelor-style reality TV show for the chance to become the wife of the prince. At seventeen, America Singer is the perfect age to be entered into the Selection for Prince Maxon, the only son of the king and queen and heir to the throne of Illéa. The problem is that America is already madly in love with a boy from her hometown. Inclusion in the Selection will bring upward mobility for the Singer family, and with the strict numbered caste system in place, America can't turn her back on the opportunity. After all, even if she IS chosen, what chance does she have with thirty-four other girls, nearly all of whom come from higher castes? The Selection is like the Hunger Games if the violence was removed and replaced with the glimmering gowns and splendor of the Capitol. Instead of tributes fighting to the death, we have pretty girls trying to seduce a prince. Both competitions are broadcast to the general population in the ultimate reality TV. I love this book for the guilty pleasure that it is. It's as addictive as chocolate, and really captures the drama and energy that makes it so difficult to turn away from reality TV shows. The descriptions of the luxuries of palace life contrasted with America's humble origins makes me eager for the inevitable movie adaptation. There are a few forehead-slapping moments when I want to shake the characters for saying or doing something stupid, but in the world of reality TV this is all part of the entertainment, so I find myself far more forgiving of America's bone-headed moments. Prince Maxon is every inch the perfect, sensitive, well-meaning royal searching for true love from girls who desire him for the money or fame his position brings. I can't help but pity the poor guy; he's under tremendous pressure PLUS his love life is on display for all the world? How humiliating. I kept waiting for some darker aspect of his personality to surface, but other than a few haughty moments that I would expect from a boy from such a privileged, sheltered background he's pretty much a perfect gentleman. I don't quite know what to make of America, our heroine. She's an interesting young woman. Initially, she enters the Selection because both her mother and her boyfriend think she should for the potential prestige, but no expects her to be a serious contender. By being honest with Prince Maxon about her wishes for the competition and offering him an alliance of friendship instead of romance, America manages to secure her position in the Selection. It's very cleverly managed. But a pretty young woman in a YA novel inevitably ends up in a love triangle, and America's moping over her sweetheart Aspen and her burgeoning feelings for the Prince are quite predictable. The world-building is a bit vague, but if further developed it could be quite intriguing. Illéa, built in the ashes of a fallen America, is at war with New Asia. The country is also imploding, with rebels attacking the palace with a frequency quite disturbing to contestants in the Selection. I ripped through this book with rare speed, and immediately started hankering for my next fix in The Elite. I don't pretend this is great literature, but it is delightful and entertaining, the perfect antidote to the more serious novels with important messages that I must read for work. To read more about The Selection, buy it or add it to your wishlist click here. 2008: Discussion Question: Explain Your Screen Name! Plot Summary: A secret government agency recruits some of the most dangerous incarcerated criminals to form a defensive task force, with their first case leading to a potential apocalypse. Plot Summary: A little girl lives in a very grown-up world with her mother, who tries to prepare her for it. Her neighbor, the Aviator, introduces the girl to an extraordinary world where anything is possible, the world of the Little Prince. 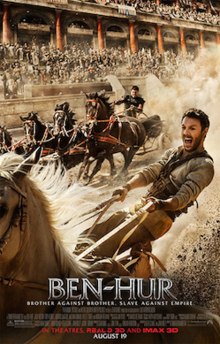 Plot Summary: Judah Ben-Hur, a prince falsely accused of treason by his adopted brother, an officer in the Roman army, returns to his homeland after years at sea to seek revenge, but finds redemption. 2008: Contest: Neil Gaiman Extravaganza! From Annie Proulx—the Pulitzer Prize-­ and National Book Award-­winning author of The Shipping News and “Brokeback Mountain,” comes her masterwork: an epic, dazzling, violent, magnificently dramatic novel about the taking down of the world’s forests. Proulx’s inimitable genius is her creation of characters who are so vivid—in their greed, lust, vengefulness, or their simple compassion and hope—that we follow them with fierce attention. Annie Proulx is one of the most formidable and compelling American writers, and Barkskins is her greatest novel, a magnificent marriage of history and imagination. There's been some positive buzz for this book at our bookstore, and I do like a good masterwork of historical fiction. I haven't read any of Annie Proulx's previous books - or see the movie Brokeback Mountain, for that matter - but that just makes me feel more curious. 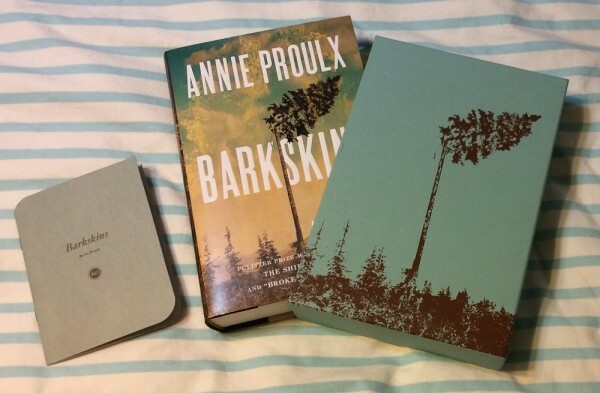 Like all Indiespensable books, Barkskins is signed by the author and comes in a custom slipcase with a small chapbook that includes an interview with Proulx. From “quite possibly America’s best living writer of short stories” (NPR), Ninety-Nine Stories of God finds Joy Williams reeling between the sublime and the surreal, knocking down the barriers between the workaday and the divine. Pulitzer Prize and National Book Award finalist Joy Williams has a one-of-a-kind gift for capturing both the absurdity and the darkness of everyday life. In Ninety-Nine Stories of God, she takes on one of mankind’s most confounding preoccupations: the Supreme Being. This series of short, fictional vignettes explores our day-to-day interactions with an ever-elusive and arbitrary God. It’s the Book of Common Prayer as seen through a looking glass―a powerfully vivid collection of seemingly random life moments. The figures that haunt these stories range from Kafka (talking to a fish) to the Aztecs, Tolstoy to Abraham and Sarah, O. J. Simpson to a pack of wolves. Most of Williams’s characters, however, are like the rest of us: anonymous strivers and bumblers who brush up against God in the least expected places or go searching for Him when He’s standing right there. The Lord shows up at a hot-dog-eating contest, a demolition derby, a formal gala, and a drugstore, where he’s in line to get a shingles vaccination. At turns comic and yearning, lyric and aphoristic, Ninety-Nine Stories of God serves as a pure distillation of one of our great artists. Hmm. Not sure I'm interested in this second book. Joy Williams is not an author I'm familiar with, but one thing I've learned about myself is that I'm not a big fan of short story collections. Well, that's not entirely true...I like compilations of many authors, but if it's just one author I tend to get bored after 3-4 stories. But I'll give this a try, since Powell's sent it. I can trust their booksellers' judgement, right? 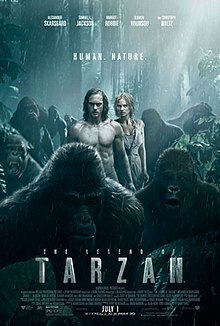 Plot Summary: Tarzan, having acclimated to life in London, is called back to his former home in the jungle to investigate the activities at a mining encampment. Plot Summary: A girl named Sophie encounters the Big Friendly Giant who, despite his intimidating appearance, turns out to be a kind-hearted soul who is considered an outcast by the other giants because, unlike them, he refuses to eat children. 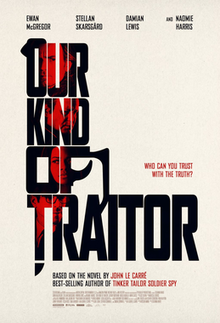 Plot Summary: A couple finds themselves lured into a Russian oligarch's plans to defect, and are soon positioned between the Russian Mafia and the British Secret Service, neither of whom they can trust. 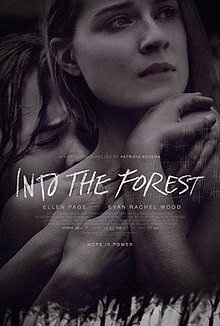 Plot Summary: After a massive power outage, two sisters learn to survive on their own in their isolated woodland home. Plot Summary: A high school senior finds herself immersed in an online game of truth or dare, where her every move starts to become manipulated by an anonymous community of "watchers." Plot Summary: In 1951, Marcus, a working-class Jewish student from New Jersey, attends a small Ohio college, where he struggles with sexual repression and cultural disaffection, amid the ongoing Korean War. Quarterly Co. is a subscription box service company that partners with celebrities to "curate" boxes, usually themed around food or fashion or cool gadgets, which are mailed out four times a year. 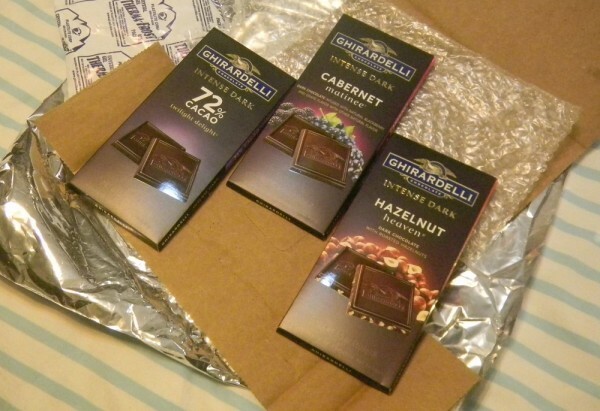 For their book and chocolate-themed box, Quarterly partnered with Ghirardelli. Chocolate and books are two of my favorite things to consume. I go through both in absurdly large quantities. Pairing the two items in a subscription service? That's a match made in heaven! 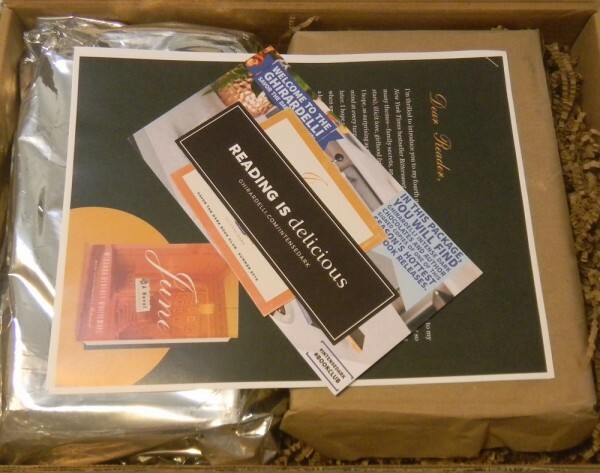 I found out about Quarterly's Savor the Dark Book Club, a subscription box limited to only three mailings, and immediately wanted to sign up. I did question the wisdom of shipping chocolate bars in the summer heat, but after considering the amount of candy I've had sent to me and the fact that I can't think of any major meltdowns, I thought it would be safe enough. I opened the box and it looked like there won't be any problems with melted chocolate. It was packaged separately in its own box, next to an ice pack and wrapped in another bag. 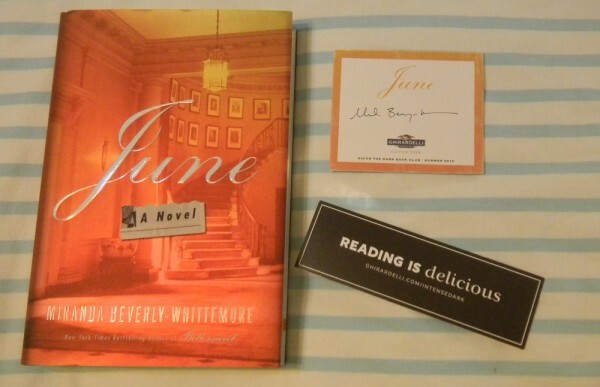 I turned my attention to the letter at the top of the box, a note from Miranda Beverly-Whittemore welcoming readers to her novel. Attached to the letter was a list of discussion questions for her novel June and several recipes that I think must tie into the novel, because not a one calls for Ghirardelli chocolate. Sounds OK. It's not a novel I would have been likely to pick up on my own, but it sounds interesting enough. I'm sure I'll find it diverting enough on a lazy summer afternoon. The book was not autographed by the author, but a bookplate that she had signed was thrown into the box. It's not nearly as collectible, but the fact that they thought to include it was a nice touch. The luxuriously deep and velvety dark chocolate in Cabernet Matinee is infused with the tart flavor of blackberries and Cabernet Sauvignon grapes delivering unrivaled chocolate intensity. Experience a moment of timeless pleasure with Ghirardelli's Intense Dark chocolate. The luxuriously deep and velvety dark chocolate in Hazelnut heaven is infused with crunch, deep roasted hazelnuts delivering unrivaled chocolate intensity. Savor a moment that will carry you through your day. All three of these chocolate bars sound delicious. I've had some of the Intense Dark chocolate bars before, and they always have a nice balance between the bitterness of the chocolate and the added in flavors like blackberry and hazelnut. The Savor the Dark Book Club is a nice enough idea, but it's rather a poor deal. Each box is $45 ($40 + $5 S&H) and the value of the items inside is nowhere near that. June is a $26 book, and 3.5 oz Ghirardelli chocolate bar sells for $3.95 at the grocery store (and often will be on sale for $$2.50 or $3). Most subscription boxes have a value higher than the price tag, since it's likely that the recipient will like every single thing in the box. After seeing the contents of this box, I immediately canceled the subscription. I can pick my own book and my own chocolates without the risk of getting something I don't want. It's too bad, because the box idea was a good one. If another company attempts something similar in the future, I'd be open to trying again. I'm really excited about this month's selected book! I don't know much about Homegoing but one of my co-workers has been absolutely RAVING about it for weeks, and her enthusiasm makes me want to drop what I'm currently reading and dive in. 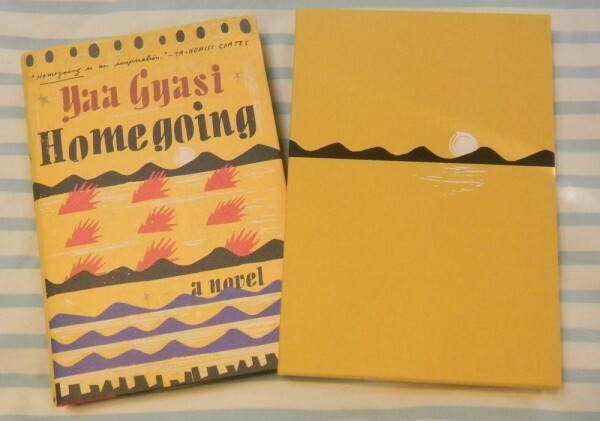 Like all Indiespensable books, Homegoing is signed by the author and comes in a custom slipcase. It's so simple, yet elegant. I love the way these slipcases look when they're all lined up on my shelves. A small yellow chapbook is also included with the book that includes an interview with Yaa Gyasi. This is just the sort of notebook I'm always looking for! It has unlined blank pages, a pocket on the back cover for miscellaneous bits of paper, an elastic band so the book won't fly open when jostled in a bag, and it's roughly 8" x 6" so it's quite portable. This is great! 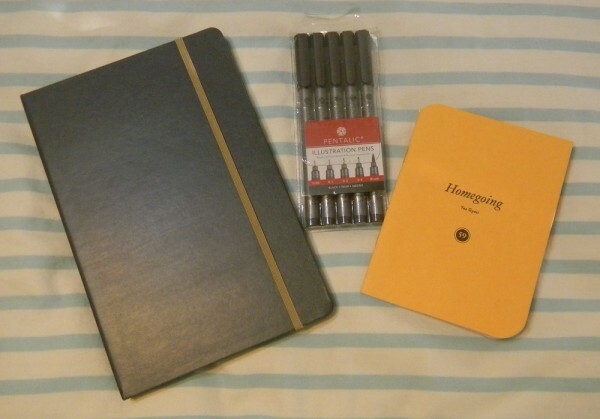 When I'm not geeking out about notebooks, I can get pretty obsessive about pens. I'm not a snob, by which I mean I don't have a brand that I'm strictly loyal to, but one of the easiest ways to put a smile on my face is to tell me to go to Office Depot and pick up some new pens for the office. I'll spend an hour poring over the different features and testing the smoothness of the ink flow. I think it's so cool that Powell's is encouraging Indiespensable subscribers to express themselves. Whether this notebook gets used for taking notes on books while you're reading or for making diary entries or observational sketches, it's a fun, bookish thing to include. 2010: Discussion Question: How Big Is Your Library?